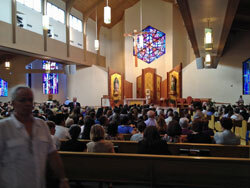 Last week I attended Mass at Holy Cross Catholic Church in Orlando. I got in just in time for the noon Mass in spanish. It was standing room only. This picture is before it really got crowded. By the time Mass started there were people standing outside who couldn’t get it! It’s not a small church either. I assume this is a healthy sign. There was a lot more hand clapping, laughing, hand waving and hugging than I care for but I guess that’s the cultural difference between these folks and what I grew up with. The Mass is still the Mass and Jesus is there just the same. I never became fluent in Spanish but that doesn’t mean I didn’t understand what was going on as it relates to the different parts of the Mass and the prayers that were being said.